Cheers greeted guitarist, bass player, drummer and keyboard man onstage and there was a shout of ‘Come on Bettye’ from the audience. Their music was a hybrid of gritty funk mixed with the easiness of jazz and they jammed a bit before Bettye joined them. There was a strong sense of anticipation in the house, with many audience members on their own, despite the late for a weeknight, 10pm start time. From song no. 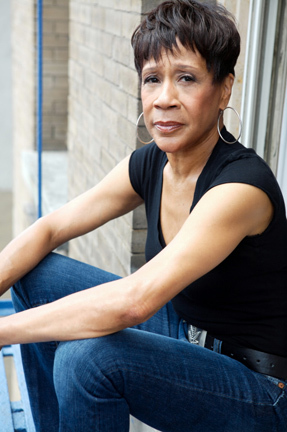 one –‘It’s a Word – Love,’ Bettye LaVette was an absolute knock-out, proving her reputation of ‘The Great Lady of Soul’’ as her voice exuded raw, powerful, stripped back soul! She wasn’t the front woman, she was THE woman. I’d heard Bettye and looked at clips of her performing live on You-tube, but I’d never actually seen her sing before, so I was bowled over! We’ve been calling guys ‘The Man’ for ages when they’re great, so it’s time we gave Bettye her dues. I’ve been to lots of concerts in my life, but I’ve never heard anyone sing quite like Bettye. To simply say she ‘belts it out’ would be an injustice, because she actually moves the soul with her singing. She is definitely one singer/songwriter who lives her songs. On ‘I Ain’t Got No Time to Live,’ for example, when she sings – ‘So many times I’ve seen that wheel of fortune, spinning round for the one who was holding the ace...’ those words are sung as lived, and her pain and frustration are almost palpable. And unbelievably, considering the upbeat nature of the original, Bettye’s version of Ringo Starr’s ‘It Don’t Come Easy’ from her latest album, recreates the song, making it so achingly moving, it seems autobiographical. Bettye rings every drop of emotion from each and every word of every song she sings, and every song she sang, funky strut your stuff or bluesy ballad was met with cheers. ‘I’m gonna say something I never thought I’d say, said Bettye drolly at one point, I have a new CD.’ Explaining why she chose to sing well-known British rock songs on her latest album, Interpretations – The British Rock Songbook, she was philosophical, claiming the songs were, ‘the nemesis of her youth,’ while her own records were played only ‘on small black radio stations.’ But, as her latest selections had, initially, been ‘sung by twenty year olds,’ she is ‘now able to present the adult version of the songs.’ Makes sense, especially when you hear Bettye them! That said, it took me a while to realise the next number ‘All of My Love’ had actually been, in its original incarnation, a huge hit for Led Zeppelin! Another, very sobering fact Bettye relayed was that, when she had ‘nowhere else to go – you (British people) would always bring me over’ and she’d sing ‘somewhere, for £50.00 a night’, adding ‘It might be the only gig I’d have for three years.’ This album is a ‘thanks’ for the unwavering support of her British fans. From what I’ve heard of it, a fine tribute it is too. In the tradition of James Brown, who Bettye toured with as a teenage recording artist, she is always on the move when she is performing, getting into her songs, going wherever they take her. There seems to be a great rapport between her and her musicians too, with scowling, then laughing Music Director/Keyboard/Acoustic Guitarist, Alan Hill, intermittently interacting with Bettye throughout. Then there are the bumps and grinds Bettye enacts towards her ‘young’ guitarist, Brett Lucas and protective bass player, Charles Martin, whom she told the audience ‘watches over all her bass notes.’ Meanwhile, drummer Danny Peters keeps things rolling along. Bettye’s very enlivening, inspiring show seems to shout that we should all get down till we drop, and why not? A much needed ‘senior citizen moment’ during which she sat down on the stage while she sang ‘You Don’t Know Me’ reminded us of both her, and our own humanness and mortality in a warmly comic way. Based on the many glistening eyes around me by the end of it, in addition to my own, Bettye’s acapella encore, Sinead O’Connor’s ‘I Do Not Want What I Haven’t Got,’ from Bettye’s award winning, I’ve Got My Own Hell to Raise,’ brought lumps to many throats. I’ve never been so hoarse at the end of a concert from cheering either, and judging by the din, that was a unanimous activity! When Bettye opens up and wails, it’s not just an assault on the senses, but on the sensibilities themselves. Her phrasing is pure soul, her delivery – pure truth. She may be hard-working, but her talent is God given and her early manager of ten years – Jim Lewis, was right to stay on her so she’d develop her gifts to the max by taking vocal and staging lessons, enabling her to perform indefinitely, even if her career has been rocky. Thankfully, Bettye’s career has sure taken a Rocky turn now! Granted, though Bettye’s wonderful voice is a gift, it’s one she hasn’t had the chance to use as much as she would have had fate been kinder. Though she had a lucky break at sixteen in Detroit, despite a promising start with two chart singles on Atlantic in 1962, subsequent 45’s never clicked like they should and an album deal wasn’t forthcoming. Whether it was ‘buzzard luck’ as Bettye says, or timing, lasting success eluded her. A starring role with Cab Calloway in Broadway musical, Bubbling Brown Sugar and a disco hit single, ‘Doin’ the Best That I Can’ in ‘78 both, curiously, failed to solidify her career. But, the release of 2003’s A Woman Like Me, earned Bettye the coveted W C Handy Award in 2004 for “Comeback Blues Album of the Year”, and 2005’s, I’ve Got My Own Hell to Raise - with songs written and performed by women singer/songwriters clicked in a big way. And, ever since, Bettye has received a whole slew of honours, putting her on a belated path to the world-wide fame she’s always deserved. Her spirited duet with Jon Bon Jovi on Sam Cooke’s ‘A Change is Gonna Come’ at President Barrack Obama’s inauguration helped make her a household name in the US. For me, the only singer who was definitely in Bettye’s league in terms of blistering emotion in song was the late, great Otis Redding, whom I never saw live, as I was a very young fan. However, I saw the man Bettye claims to sing most like – Wilson Pickett, in the ‘80’s on a double bill with James Brown, and I can tell you that like Bettye, Pickett nearly blew the roof off with his raspy, electrifying voice. Once, it might have been a disadvantage for Bettye that she ‘doesn’t sing like Dionne Warwick’, as she says, but it’s not a disadvantage now. Bettye, I’m very happy to have ‘made your acquaintance’ through your live show, which, despite all the comparisons was simply, incomparable! If you ever get a chance to hear the extraordinary Bettye LaVette sing live, jump at it! By all means, buy her albums and listen to them often, as you’ll find a kind of soul sanctuary in them. But you’ll know Bettye best if you see her perform, and having done so, you’ll never forget the experience.